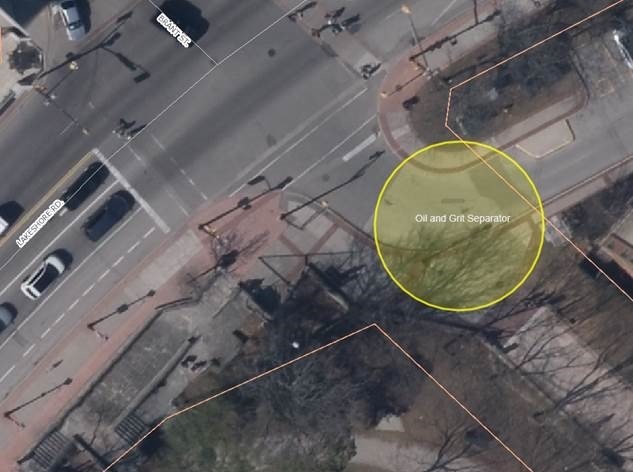 Notice — The installation of an Oil Grit Separator at the end of the Brant Street storm sewer (terminating at the Waterfront Hotel) is being proposed. The device will be installed on an existing storm sewer line to improve the quality of stormwater runoff before discharging into the lake. The sketch below shows the proposed location of the device adjacent to Brant/Lakeshore. Anticipated construction start is September 17, 2018 and substantial completion date is October 12, 2018. Festivals & Events staff were consulted and they confirmed that the project timeline will not impact any event. During construction the laneway to the Waterfront Hotel will be closed. Hotel management is made aware of this project, during construction they will be using the alternate entrance. How much for this “oil & grit separator”? Seems redundant as it will likely be dug up when they demo the hotel?? Marianne what I would like to see and I am sure other residents would also is a side drawing of the tunneling they are doing on Guelph Line and the purpose of the project.. This project will be going on for another year and it does disrupt traffic at Prospect, Harvester and Mainway. There has to be a tremendous amount of excavation and logistics to do the work and remove the tunnel material, If this is explained to the residents they may not be so upset with the Inconvenience.